Stunning views and different trails for each level of experience are offered within the 210 hectares of Estancia. Peuma Hue is a beautiful eco-resort in North Patagonia and within the Nahuel Huapi National Park, minutes from the city of Bariloche, at the foot of Cerro Catedral and bet on 3 km of lake coast. We cover flat terrain in the valley, mountainous terrain on the surrounding slopes and forest and our horses - incredibly trained by the horsewhisperer, Cris Barrett - even swim in the lake with our visitors, who marvel at the opportunity to live an unforgettable experience with a animal friend. The riding begin in the stable, where the guide chooses the horse indicated for each passenger, saddles them and provides the necessary equipment (helmet and chaps) for each one. After checking their experience and offering instructions, the riders leave at the direction corresponding to their level of experience and previous rides. We adapt to different ages and experiences - from beginners to experts - and by different paths. After the ride, passengers will have time to rest and enjoy in a dream setting a BOX LUNCH prepared in the Estancia where meals are balanced, delicious and healthy, based on homemade products. The products used to create our culinary experience come from the organic garden and greenhouses and from our fruit trees, all located within the Estancia; as well as producers in the area, creating harmony between body and nature! At the end of lunch we will give way to specialists in kayaking in the National Park, who ensure professionalism, great knowledge of the area and first class international equipment. You will explore the wonderful crystalline waters and virgin coasts of the Gutiérrez, and return paddling to Estancia. After having lived a day of intense contact with nature and high fun, we will move back to the city. 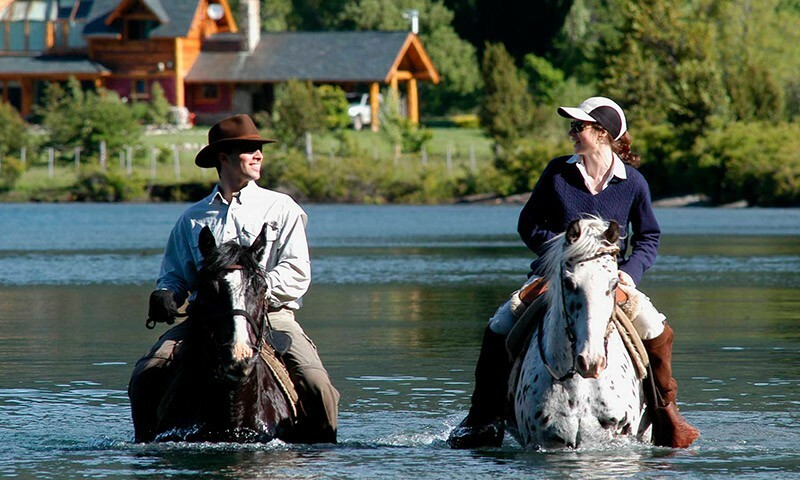 Low-mid-kayak and horseback riding at a relaxed pace, always close to the shores of the lake, and with all the necessary safety equipment. We pick up in the hotels from 10 am, and bring them back to the hotel approx. at 5:00 p.m. The regular day-tour leaves every day of the week. 2 hours of kayaking, and 2 hours of riding, approximately (these hours are spread throughout the day).